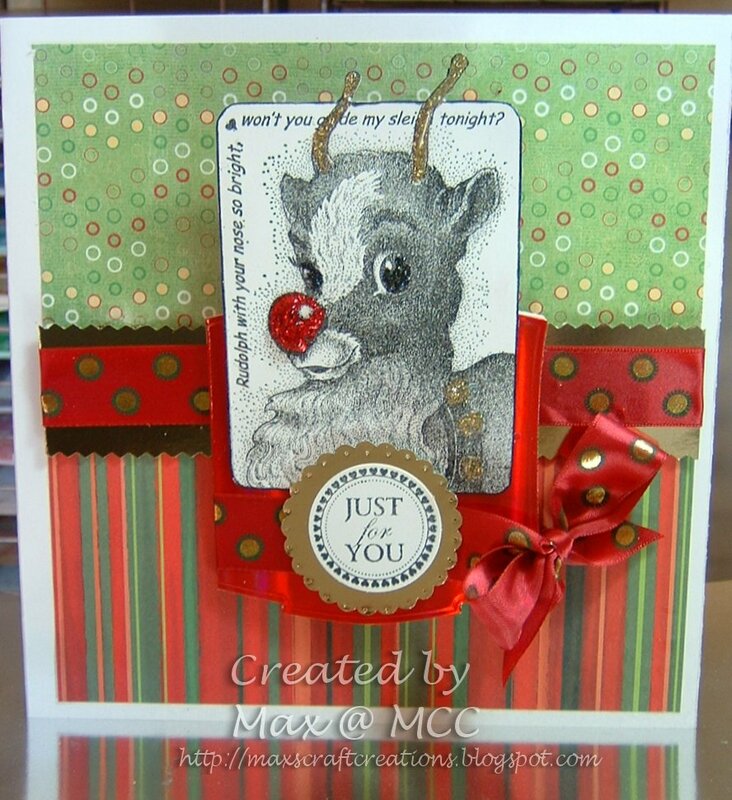 When I saw this week's challenge theme of A Christmas Carol or Song, it was a 'no brainer' to choose 'Rudolph The Red-Nosed Reindeer' and give this fabulous Hampton Art stamp it's first airing of 2010. Measuring 5" x 31/2" it is quite a large wooden stamp but I do love it despite it hogging so much space in the drawer. 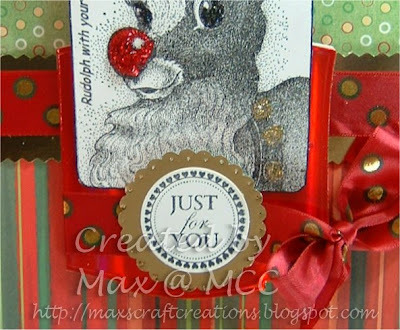 I stamped him onto smooth white card with black ink and embossed with holographic powder. The only colour added was by way of red, gold and black Stickles and this was set aside to dry whilst I prepared the card. I love how his nose looks especially sparkly and shiny. The papers were offcuts from my scrap box, but I'm pretty sure they're HOTP and they were placed onto an 8" x 8" white card blank leaving a border around the edge. Spotty ribbon was stuck onto a strip of gold mirri card which had been cut with zigzag scissors and this was then placed over the join with foam pads. Using the largest Labels Two Nestability shape as a template, I drew around it with pencil onto folded red mrri card, slightly overlapping the fold and cut it out by hand to make a mini card for the front ... wasn't keen to risk damaging the cuttlebug trying to force it through the rollers. I then used a smaller shape to cut out the printed lyrics and the red mirri card used for matting was trimmed with zigzag scissors. 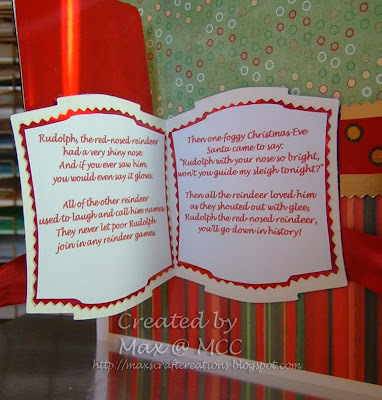 More spotty ribbon was used to tie it shut before mounting it onto the centre of the card front. Silicon glue was applied to the lower portion of the stamped image and stuck in place. Circle punches and a simple stamped greeting placed on top of the ribbon tie finish things off nicely. It's Prize Challenge week at Bah! Humbug! so come and play along to be in with a chance of nabbing some goodies. Both Ann and Irene have lovely cards to show you too so there's no shortage of inspiration and if you haven't already started your 2010 Christmas cards then now might be a good time. There's only 112 SLEEPS left y'know. Oh I do love your card, Rudoloph is fantastic especially with his red noseand gold antlers !! What a fabulous idea to include the words also - now you will have me singing the song all day. Love this stamp and the card you've made - very suitable for the challenge. I'll be going through my stamps and things shortly to find something to use. Just brilliant Max - I love this stamp and you have used it to perfection. The way you have put the song on is inspired - totally fantastic. Oh, your Rudolph is so cute. I love him. Can you give me a link, where do you bought this stamp? This is so adorable. Love the layout it is gorgeous. Adorable card and cute rudolph.